Perfect for your take-out restaurant, cookout, party, gathering, or other catering event, this Visions clear heavy weight plastic fork will exceed your serving needs! Complete your plastic cutlery setting, or use it to fill your flatware bins at your snack shack or concession stand. Made of durable polystyrene, this virtually shatterproof, disposable fork is strong enough to last through your meal service, and can be easily disposed of, making cleanup a breeze. Nothing annoys me more than being served a wonderful plate of food then given a weak little fork with which to eat it. Ok, maybe there are other more annoying things. But these forks are of heavy duty quality and there is no where else that you'd be able to get 100 heavy duty forks at this price. Will definitely reorder when I run out. Sleek, sturdy, and affordable clear forks. Our order arrived in a very timely manner and the product in great shape. Very happy with our purchase! Great, sturdy forks. We use these during all of our consultations for our guests to eat there cupcake samples with. We've never had an issue and they are a great price. I was hoping these would be a better quality than they are. When I think heavy duty I think sturdier than these. They will work fine for desserts. These were ordered to be used at cocktail hour. I liked that it added a perfect touch of elegance to the event. I recommend these highly and will order again. They are also super study and can be reused with care. Absolutely love the forks , price is better than anywhere else , you are going to be happy with this choice. If you want to save money and have been purchasing from Uline.com before this is a great replacement. Great price for a strong disposable utensil. Clear "color" is crystal clear and looks sharp for use at parties, family events, etc. I use them for every function we host throughout the year and have not been disappointed. 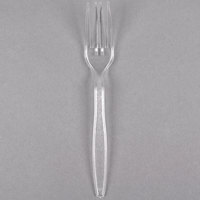 Clear plastic forks are very useful to have because some customers prefer the clean, crisp look of “acrylic” flatware. These are sturdy and easy to handle. i had been buying my fork at another store but the fork from this site and the best and i get more forks and it last longer. i rated the forks a 5 stars. Good heavyweight utensil used in wedding SETUP where GUEST had chicken and Steak to eat. Forks did not break under pressure pretty design as well! These forks are heavy weight and very durable, they don't break like some other brands do. They look nice enough for a dinner party but also cheap enough to use for everyday. These are about half the price of the plastic forks I can find in my local store and the quality of these is much better. Not flimsy at all. Good purchase. We used these for our daughters wedding reception and they were very sturdy and looked nice for our purpose. We served a few hundred people and didn't see any broken plastic forks and had happy guests! Bought these for our office because the ones from the grocery store kept breaking on us. These are literally incredible!! I cannot believe how sturdy they are- the description says heavy weight but they surprised me. These will be a staple in the office and even my house from now on! These are perfect for using at parties. Since they are clear, they match any color scheme and they are so sturdy. We’ve never had a complaint yet! I’d highly recommend. Very nice looking, neutral and sturdy. Not worried about them breaking while in use. We purchased them for use on an italian buffett where they will have tonstand up to crunchy salad veggies, sausage, meatballs etc.. but they would be perfect for any occasion! We absolutely love these forks! They are very durable, yet economical. We use them for all of our catering events. They work well for solid foods without breaking, such as chicken quarters! Great quality, fast shipping. I've been using these forks for a few months now and haven't had any breakage. They handle anything from steak to pancakes with ease. the only drawback is I wish the edges were smoother. These forks are very sturdy and attractive. They held up well to some heavy foods and there were no complaints about using plasticware. They are also a great size. Love these forks. They are very durable for serving things like chicken or beef where you require sturdy utensils. I would highly recommend these forks. Great for at a great price. They're very sturdy and the design is simple enough that it can be used for any event we may cater! Bought these forks to use with a pie bar for an event. Very sturdy forks at a great price. Don't break easily & look nice. These forks came neatly stacked in one box, very easy to use in spite of the large number. They are sturdy and look nice on the table. Very sturdy and visually appealing. The only thing I did not like was if you put the fork in something hot (still edible temperature) the prongs would melt. Other than that these are great! These are the absolute best forks. Full size and sturdy. Perfect size and color. Clear goes with any décor you want to use. I would definitely order these forks again. While I would consider these forks to be a step above a cheap version of plastic ware...I would not consider them to be as sturdy as some of your higher end heavy weight plastic forks. If you are planning on using the fork to serve a dinner that may require "cutting" something like chicken or exerting a level of force, I would purchase a higher quality product as this fork would most likely break. However, if using for something light such as refreshments, birthday cake, etc...this fork is perfect! And, you CANNOT BEAT THE PRICE!!!! Durable and lightweight! Great for BBQ’s or for packing lunches. Planning to get the spoons and knives to keep on hand for future parties. Thank you for a great product! These Forks are perfect for our everyday use. They are sturdy and a great price for bulk utensils. I will definitely be ordering more of these in the future! These are the only disposable cutlery that we stock in our restaurant. They are more expensive than the white heavy weight plastic knives, but they are way way better. I couldn’t imagine trying to cut a piece of chicken with any other type of disposable knife. These go perfectly with the visions spoons and are just as sturdy. A very good value as well as an elegant setting on a table for family functions. I won't buy any other disposable fork again except this one. Perfect! None of the prongs broke while eating steak and chicken from the bbq. I just wish they were a bit more eco friendly. However, you just cant beat that kind of quality! This forks are heavy weight just as stated. The price is amazing for the amount of forks you get and the quality. Love this product!! This may be the most impressive thing I ordered from this site. Very high quality, heavy duty forks. I’m using these for guests at my rehearsal dinner and don’t feel embarrassed in the slightest because these are awesome. These were used at our wedding! The clear utensils made it easy to match any theme! They were very sturdy and the price could not be beat!! Best price for a sturdy and quality plastic fork. Perfect for large events or stocking up. I would definitely recommend this product to anyone who is entertaining or even small businesses! These forks are a good value for the money. We have used these for several events and not had any problems. We will definitely by these again! These forks are nice and sturdy feeling. We will be using them at our parties and for many social gatherings after. What a great price! A good way to get a ton of forks. This is the best value, however it makes counting forks for smaller events a bit more troublesome. Great heavy duty clear forks. They are much sturdier than the cheap white ones you see sometimes. They look expensive but are a great price. I love these forks. They are strong enough to use on a variety of meats. They don't break or bend when you apply pressure. It almost feels like you are using a real fork. Thank you for having exactly what we need. The forks are very durable, heavy, steady not flimsy or breakable. They were used at a large family reunion barbecue . Great quality forks. Love them. Very durable and convenient. Stands up to even steaks. The price in way better than in the store and the quality is also better than the ones in the store. You can't go wrong with this fork. Crystal Clear, heavy and solid weight, and quick shipping. What's not to love, this forks work perfect for our to go lunch orders and dessert stations. Purchased these for use at a wedding for the appetizers and cake. The forks are heavy duty and I would recommend them to anyone for use at a party or while camping. These forks are a nice quality for plastic forks. We used them for a large event serving bbq pork and they were up for the heavy food items. A great value when you buy the case. Perfect product for all of my event plans. I will be purchasing more for the coming holidays and for my everyday use in my home and work. These are sturdy, clear was a great choice as we can use them with any decor. NONE OF THEM BROKE! We purchased quite a few but will always return to purchase again. Love them! Matching Set is best! We purchased all three utensils. Very happy with this buy. If you are looking for a heavy weight and low price plastic fork this is a good option. Our biggest issue with these is that they cannot be recycled, but if you are looking for a low cost option for your food truck or cafe these are nice. They can also be used with your to go orders. Awesome quality, very heavy duty, perfect for our football parties ! Quick shipping and easy ordering online. Cheaper than buying local. I will be buying many more in the future ! In our household family of four and very busy and often hectic lifestyle, we use a lot of paper and plastic ware. Why not order in bulk? So glad we did. The quality is great and is much more affordable than buying in smaller quantities. These forks are a great bargain; they are strong and study and look much better than the traditional white or black plastic forks. I would highly recommend them for their quality and price. I use the, folk, knife & spoon at the Guest table for our beach wedding, They were very hard & sturdy & it went lovely with the clear plates. These did not feel as heavyweight as some other plastic utensils I've tried, but they are plenty sturdy and looked very good at table settings. I don't remember any of them breaking accidentally. These came in a large box, very neatly organized. Have a nice weight to them. Can't wait to use them for my wedding events, and probably for many events after. What a great deal for these heavy duty plastic forks! They are a high quality product, packaged in an ideal way--seperate from other utensils so that you only purchase what you need. Perfect size, weight and price! Great disposable flatware, I was very happy not only with the price but with the quality. I have no plans on trying any other brands as this will be my go to choice. We used these for a large backyard BBQ we hosted in our backyard. They were great quality. I will continue to uses this line of product for future use! Good quality! A very reliable fork! I will purchase this product again. Its clear and heavy weight plastic fork 1000/ case. So far none are broken. This cutlery is top-notch. I bought them for my daughter's bridal shower and they looked quite classy on the table and are sturdy. They are a steal for this price! These plastic forks are definitely heavy weight! They are not a standard "heavy weight" plastic forks from the grocery store. Very durable and holds up to heavy food selections. I like how these are heavy weight and so they work nicely for foods that might need a sturdier utensil. I like how they look nice being clear. Use the vision clear heavy weight ulterior, spoons, forks and knife es for a wedding reception, all were good weight and held up well for the meal. These forks were great quality for the price. We used them for an informal brunch following a wedding and they worked out well. Would recommend/reorder again. I absolutely love this product! This clear heavy weight plastic forks are strong and not flimsy at all! These forks will last and not break easily. Great quality! I love clear cutlery not sure why, so naturally I prefer these overall, and they're heavy weight so they can take a beating, love these sturdy forks! We were exceptionally pleased with the plastic forks ordered. They were exactly as stated...heavy weight and their appearance was very nice. I would highly recommend using these for large social functions. The quality of these forks was just what I wanted to use for our reception following our wedding anniversary vow renewal service. Great delivery as well. Another great product from webstaurant at a great price too. I'm no longer gonna need to worry about the camping trip. The Visions Heavy Weight line of flatware are all great products. They are sturdy and do not feel flimsy or cheap in any way. The choice of four colors is a nice option as well. The clear fork is basic, allowing it to be used with any color and matches things well. The fork itself is very strong and can help you eat most foods. We got these to go with the clear plates we ordered from this site, pretty good quality for the amount of money we paid and I will most likely order again. Items arrived in timely manner, nothing was broken or chipped, good weight not flimsy, perfect for any occasion, very pleased with purchase, recommend to others. These forks are heavy duty, so they don't break in use. I ordered these for a fundraising event because I wanted a certain level of class. There are cheaper options but the difference in quality is evident. These are great little forks for takeout orders or anything really! They are much more durable than the once you would buy at the store! These forks are unbeatable for the price that is paid. They may not be the best plastic fork out there but are fairly heavy duty compared to most others. These forks turned out better then expected. They look nice enough for any occasion and our fairly sturdy for every day use. Price is great! They are Strong and nice looking, I love also the price. They are Perfects to use in any occasion. Fast shipping, I will recommend it !!! Highly impressed with the quality of this item as well as the case pricing. At this price, we can hold events and hold down our costs as well. Really appreciate having found Webstaurantstore.com. Did I mention items arrived two days after I ordered? I'm sure not every order ships this quickly but I really couldn't be happier. Also save me having to go out and buy products and haul them back to the office. Win/win. Thanks again! Fast delivery of the items. was very happy to receive this product, it will be used for a party in January. could have order nearer to the date, not knowing it would be delivered so soon. These forks are perfect for nice quality dinner forks. They were very sturdy and the price is great for the number of forks you get. These forks are very durable. I used them for a crawfish boil. They stood up to shrimp, sausage, and vegetables. No issues with breaking like a lot of forks do. Great price for a great product. I am about to order more for the next party. These will always be the ones I have at any party. Very nice heavy duty forks. We will be using these at a dessert table for a wedding reception. I am pleased with their quality. I would order these again. Good weight for a plastic fork, sturdy too. Had no problem spearing fruit or holding a steak to cut. And a great value, won't find this price in a local store!! We purchased these forks for customers who wanted to eat their scones, muffins, cheesecakes, etc in the bakery. They are very sturdy and we will purchase again. We bought the clear plastic forks to go with the plastic plates for my daughters wedding. They were strong and such a good price for a lot of people. Great strong forks are definitely worth a try. The price is right and I will be ordering more since I think is a must have for bbqs. I always struggle finding the line between affordable and durable plasticware, and this hit the mark. I don't think anyone broke a single fork during our event and the price was excellent for the quantity and quality. Wow this plastic folks are much better than from some stores. they are strong and durable we them around the house. I highly recommend this folks. Very strong forks. They got a cute design to them and they are priced very reasonable. I used them for my wedding. I would re-use for any other party. These forks are well worth their value! They are better than the ones you get at the store abs cheaper! I will be buying them again! I ordered these forks to have for catering orders. The forks are a good heavy quality that doesn't break when we use them for customers. Good product. Used the Visions Clear Heavy Weight Plastic Fork to eat a hash brown egg quiche. Easily use the fork to slice through he quiche with no trouble. Very study utensils, perfect for a recent bridal show we did where we handed out cupcakes with plates and forks to our guests. I would order again. This is truly heavy weight plastic cutlery. If there's one thing i hate about plastic its how flimsy it is and easy to break. For the price of these it doesn't make sense to buy anything else. Definitely Recommend. Exactly what I expected, clear plastic forks. They are heavy duty and fit for anything. You can have them for your home to your business to events. This was the type of fork that we were looking for our functions and every day usage at our church. It is strong and seems as it will hold up well. I was very pleased with these forks. They are very sturdy. The great price was great. Definitely have been telling friends and family about my purchase. Forks are nice looking, sturdy to eat with and are just the right size..For the price, these are a great value. Definitely will recommend it. Forks are heavy duty and do not seem to break easily. Used at a large gathering and worked great. Will purchase again. Love them and recommend. I love this product. These forks are unbelievably sturdy. I reused these forks several times. I would definitely repurchase this item again. This was sold at a great price. I love, love, love these forks! They are durable, wow! Anyone considering a purchase should try them and you will find that they are worth the purchase! These forks are an excellent quality and they look nice too. They are much better then any forks that I have purchased at the wholesale clubs. The forks are strong, sturdy and great value for the money. I would highly recomment them for anyone. We are very pleased with this fork! It looks nice and is very sturdy. We have been using it for a few weeks now and none have broken! These clear forks are better looking than the traditional white plastic ones and also much sturdier. My family and I tried them out this evening and thought they were worthy of five stars. These fork are very durable as well as decorative. We uses them often for casual weddings, showers, funerals, etc. And you can't beat the price! I prefer these forks when serving on-the-go items at a market. Forks are nice looking, sturdy to eat with and are just the right size..not too small or too big. This is an excellent value and I like that they are packaged neatly (all lined up to take up less space). That helps me transport neatly to events. These are really nice and very durable. I would recommend them for any occasion. I used them for a birthday dinner where soul food was the menu and they did not break. I was once again very hesitant to order these without knowing their quality. I know "heavyweight" can mean different things to different people! I have to say I was pleasantly surprised once these came in...they really are heavy duty, crystal clear, and just perfect for my cake shop. These are very good quality forks. We also buy Visions knives and spoons. They look nice and perform very well. They work very well for our catering. These heavy weight plastic forks are awesome. They are especially convenient for picnics or kids birthday parties. I highly recommend them to anyone whose looking for sturdy plasticware that won't break with use! Product is exactly what I needed for my function. Heavy duty, quality product. Shipping as usual was prompt and on time. I was completely satisfied. A nice, heavy weight durable plastic fork. these exceeded out expectations hands down and will be ordering again soon! Great for outdoor functions with the tougher foods such as tearing apart chicken or ribs. I thought this would be your normal clear fork, but, it is not. It is sturdy, truly a heavyweight product and very superior. Worth the price. Great Utensils. Very sturdy forks. My kids and family love these items. Great buy. I will definitely purchase again. The value was great also. I couldn't make a better purchase locally. Used at my wedding and they worked great! Works well with hot or cold foods, you couldn't even tell they were plastic I loved them! These Plastic Forks are seemingly strong. For the price, they can't be beat. We purchased the forks along with other items for a wedding bbq rehearsal dinner. This product was just what I needed. We had an anniversary party and the quantity was on point. They didn't break. They came right on time. These were very durable forks, heavy weight and nice quality. You never know what you'll get when ordering plasticware. I would order these again for another event. Such a great price for these sturdy forks! No bending, and they handle lettuce well. We have these out for customers in our café, the clear color makes for a nicer presentation. These are our go-to forks for all of our events! They are very durable and a great price! We use them on buffets, regular table settings, and every day use! Great quality at a great price! We absolutely love the fact that they come in a bulk pack at a price that can't be beat! These are perfect! Wonderful, sturdy forks, and so much cheaper than buying 100 good sturdy plastic forks at the store, glad I added them to my order. I purchased these for a few events that I had coming up. They arrived just in time. Very sturdy and the price can't be beat. Looking forward to ordering again in the future. I thought the forks was a very good price planning on using them for My wedding and sons baby shower i will decorate them with a colored napkin and curly ribbon . The utensils are sturdy and won't break when something tough is being poked. Much better than the white plastic silverware available in most department stores. I used these for a wedding and they worked great! They are very sturdy and heavy weight, not flimsy and breakable like most of the silverware I have bought in the past. Nice sturdy heavy weight forks. They are great for picnics and packing lunches. I used them recently to make Halloween cake pops. They worked great. The forks were affordable and sturdy. Nice tine length for a good bite of food and the handles felt good in the hand. My husband wants the extras to take to his work because they are much nicer than what is currently offered. Excellent quality, just like the spoons. We used it at home for everyday use when we were moving and did not have dishes or flatware. It stirs small amounts of batters decently, beats eggs for an omelet for two, and the sharp tips have no problem stabbing tasty morsels and conveying them to your mouth. Of course it has trouble piercing a hard sorbet fresh out of the freezer, and if used as leverage to open or separate items, the tines will bend or break. It is not after all, a real metal fork, but in the realm of plastic disposable forks, it is king. I bought these forks to use at a local fundraiser. They are heavy enough to not break when being used. Plus, I got them at a good price. The quality is great! I will order these again, was very impressed with the price and durability of this plasticware. Very affordable for the amount you receive. this is a great quality fork, holds up well and doesn't break times like some. Great look and our customers seem to like them. They don't look cheap at all. These forks are great, except they have plastic hangers on them from cutting. They look like little hairs, so you have to make sure you remove them all or your customers will think their is hair in their food! These are absolutely perfect for weddings or any other event. Nice and heavy, as well as functional. Well worth the price. The description truly explains the product. Great item. Very flexible so it does not break when some pressure is put on them. Perfect size and texture. We use them for our business and they look great. Our intent with this purchase was primarily low cost with tolerable quality. We got the low cost and a much higher quality than expected. We highly recommend these. These forks are super great. They are just like having a metal fork, which is what we wanted when we ordered them. Will definitely order more. The plastic wear is very strong. When they say it's heavy weight and there is 1000 in the box, that is what you get. They are great.